The key physical property of multiferroic materials is the existence of a coupling between magnetism and polarization. The origin and manifestations of magnetoelectricity can be very different in the available multiferroic systems, with multiple possible mechanisms hidden behind the phenomena. In a new review, researchers have described the fundamental physics that causes magnetoelectricity from a theoretical viewpoint. Both electric dipoles and spin moments can be ordered in solids, leading to ferro-type phases, e.g. ferromagnetism or ferroelectricity. Generally, these two degrees of freedom are not simultaneously active in solids. Multiferroics are those materials with orders of both spin moments and electric dipoles, which provide an ideal platform for these two vectors to twist together. Still, the coupling between magnetism and ferroelectricity is nontrivial since they obey different physical rules. From the symmetric aspect, an electric dipole breaks the spatial inversion symmetry while a spin moment breaks the time reversal symmetry. Microscopically, the existence of net magnetization requires unpaired spin, while the dipole formation usually needs empty orbitals. So how can they dance together? Thanks to extensive studies in recent decades, scientists now know how to activate both degrees of freedom in solids and link them together. 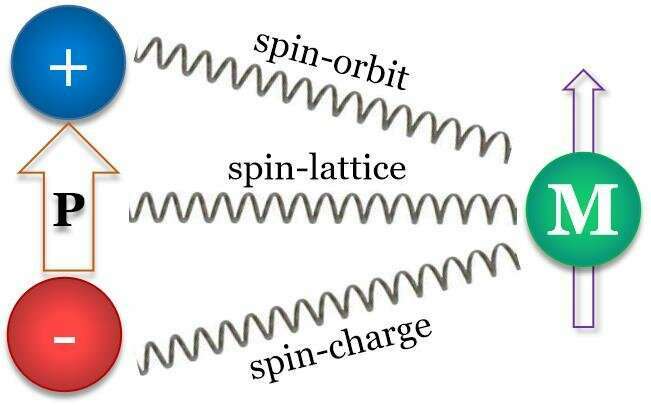 In a recent Topical Review by Dong, Xiang and Dagotto, published in National Science Review, the authors summarize mechanisms to couple magnetism and ferroelectricity, which can be categorized as three paths: spin-orbit coupling, spin-lattice coupling and spin-charge coupling. These physical mechanisms are explained with examples of typical materials.